Looking to Buy the Bluebook? The Bluebook is the accepted uniform legal citation system and it currently is in its 19th edition. First year law students are, at majority of schools, required to buy the Bluebook because that is the set of citation rules they will be learning and using during their law school career. So, for all of you who are about to spend the money on a Bluebook, the following are your purchase options currently available on the market. You may decide to buy the print version of the The Bluebook: A Uniform System of Citation. [KF245 .B58 Law Reserve]. A print copy is usually available at your Law School bookstore for purchase or you may buy it online. When you purchase the print version, be aware that it does not include any updates that may be released between editions. 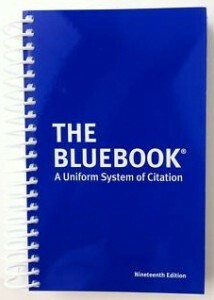 You may buy the The Bluebook: A Uniform System of Citation online. This online version is a subscription based. Thus, you would be purchasing a one year ($32.00), two years ($42.00), or three years ($50.00) subscription. This version does include updates that may be released between editions. See purchasing options here. Further, when your subscription expires (after one, two, or three years depending on your original purchase), you will be charged an annual renewal fee of $15.00. You may also go mobile and purchase The Bluebook: A Uniform System of Citation via the Rulebook app for iOS. The Rulebook app itself is currently free and available for iOS devices from Apple App store. Android app is under development. Through the Rulebook app, users may purchase a variety of rules (i.e. FRE, the U.S. Constitution, FRCP, etc.) and The Bluebook. The current 19th edition is offered for one time purchase price of $39.99, which will include any updates released between editions and there is no annual renewal fee. The Rulebook app allows users to highlight and fully annotate any set of rules purchased and used via this app. Note that on August 22, 2012 anyone with the rulebook app will be able to download the Federal Rules of Appellate Procedure, Bankruptcy Procedure, Civil Procedure, Criminal Procedure and Evidence at no charge. Those normally go for $1.99. Good luck shopping and good luck in law school!